Spectacular Telašćica Nature Park - Explore Croatia Become a Patron! Telašćica is one of the most beautiful panoramas of the Adriatic Sea, as it juxtapositions the robust and tall cliffs, the large and calm cove, the brutal rocky landscape and the colourfully diverse undersea life. Scattered like yellow-grey pearls in the middle of the Adriatic, Kornati are the most densely spread archipelago in the entire Mediterranean, featuring around 150 islands, isles and rocks. Nestling right next to them is the equally spectacular Telašćica Nature Park, located on the south end of Dugi Otok, geographically a natural part of Kornati. That is where the southern tip of Dugi Otok splits into two shanks that stick out towards Kornati and opens a large 69 kilometre long cove. The cove is part of the natural characteristics that led to Telašćica being proclaimed a nature park in 1988 – the only nature park along the coast, after it was separated from the Kornati National Park.
. We are in Telašćica, one of our TOP 10 natural spots in Croatia and TOP 10 islands. Seen from the air, the most spectacular features of the impressive image of a dozen islands scattered across the sea are the magnificent cliffs. Defying the sea and gravity, they stretch along kilometres of shore, reaching heights of up to 150 metres. 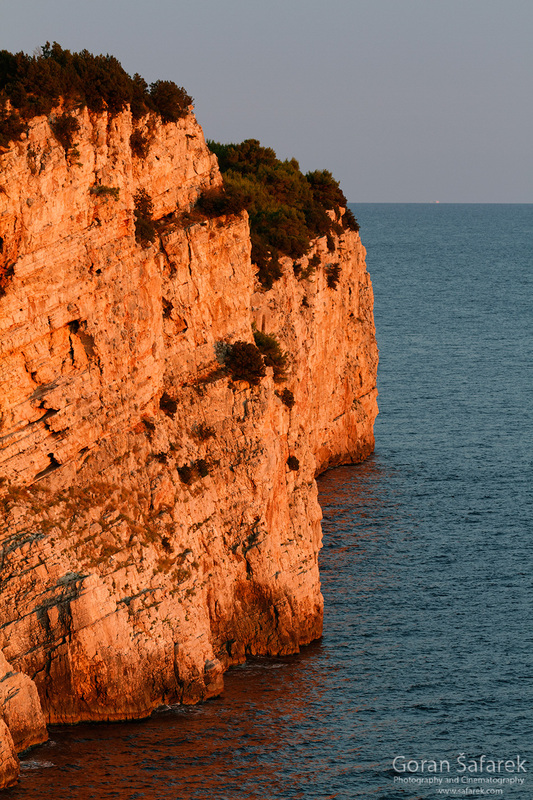 In the northwest they stretch outside of the park’s boundaries, where the Gračina cliff plunges 208 metres towards the sea. From there onwards, they gradually reduce in size until they completely disappear beneath the sea near Muravjak. Standing on the edge of the cliffs, admiring the spectacular and brutal landscape, is truly a unique experience. It is immediately clear that the surface of the rock is not flat but typical karst terrain full of cracks, bulges, steps and other indescribable shapes. Exposed to gravity, the sun and the wind, few resilient plant species survive in this extreme habitat, and one of them is the Croatian endemic species of Dubrovnik centaury. Its soft and silky leaves grow from the vertical rocks, so they cannot be reached by hand. The cliffs are also nesting grounds for the peregrine falcon, while other commonly seen animals are the kestrel, the lanner falcon and Eleonora’s falcon. The cliffs are also an afternoon stage on which the playful swifts click and perform aerial acrobatics as they hunt for flying bugs. It is also a nesting ground for ravens and the largest owl in Croatia – the eagle owl, whose wing span reaches 170 centimetres. At night the karst and the groves echo with sounds made by nightjars – small, unremarkable birds. Such a karst terrain offers plentiful living space for birds, a total of 79 species of them to be precise. Telašćica owes its unique landscape to geological forces which shaped them in such an imaginative way over millions of years. The story begins when the African tectonic plate started pushing the European one. The result was the dwindling of the Tethys Ocean – the modern day Mediterranean Sea, and the rise of the Alps and the Dinaric range. The main characters in this story were the faults. When the layers broke, a whole piece slid and fell through. That is how the cliffs were formed, and why half of them are above sea level and the other half is submerged. The vertical face of the cliff is the surface along which the two blocks slid as they separated. The area’s contemporary landscape was defined towards the end of the last ice age, when the level of the sea rose and flooded the lower parts of the landmass which once existed in place of the Adriatic. 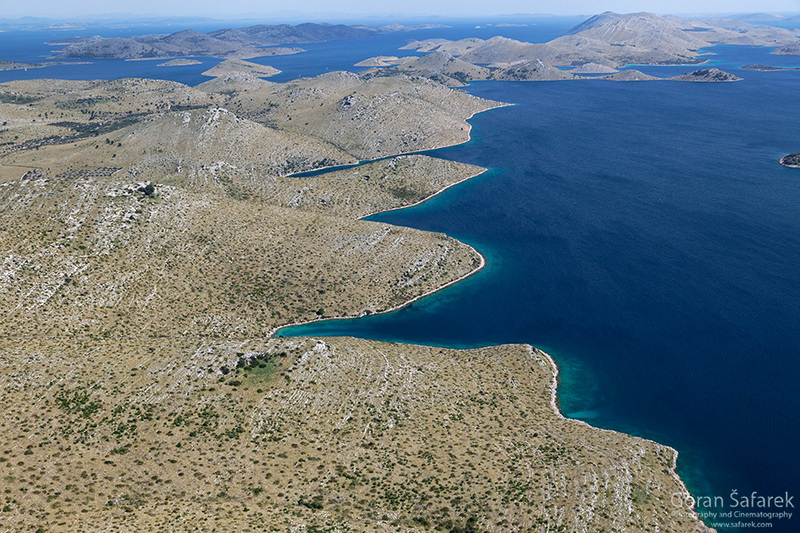 The onetime hills turned into the numerous islands of the Kornati archipelago, and the sea filled three previously dry depressions of Telašćica, three parts of the cove which are reminiscent of lakes. This is how Telašćica got its name: tri lagus means three lakes in Latin, which forms Telagus and finally Telašćica. 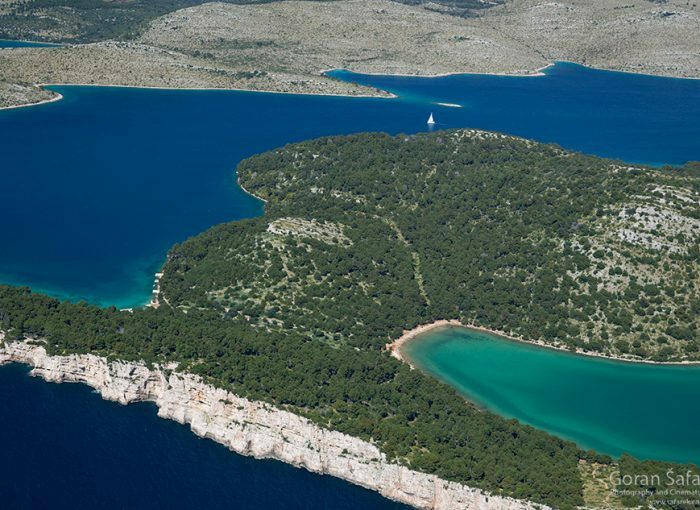 It is assumed that Kornat Island was connected with the Telašćica mainland until about 9 or 10 thousand years ago, and it was probably connected with Dugi Otok until the period between 2100 and 2400 years ago – the times of mythological undertakings of ancient heroes. While one side of the Telašćica shore is made up of steep cliffs that plunge towards the sea, the descent through the cool shade and pleasant scents of a pine forest on the other side is mild and very pleasant. An image of a calm and indented bay soon opens up, and its blueness is so lively against the barren rocky terrain. There is no view of open water, just the other side with low and gentle hills. Children swim and explore the coastal rocks in the shallow and clear sea during the summer, while white sailboats are anchored nearby. There are no concerns, as Telašćica is one of the safest and largest natural ports on the Adriatic. It is 8200 metres long as the crow flies, and it is between 150 and 1500 metres wide, but this information alone does not indicate the full indentation of the white stone line, the border of the sea which meanders into the depths of land. There is almost 70 kilometres of coast within the cove. The entire bay is reminiscent of a crab’s claw from the air, featuring one thicker and one thinner part – the cliffs. 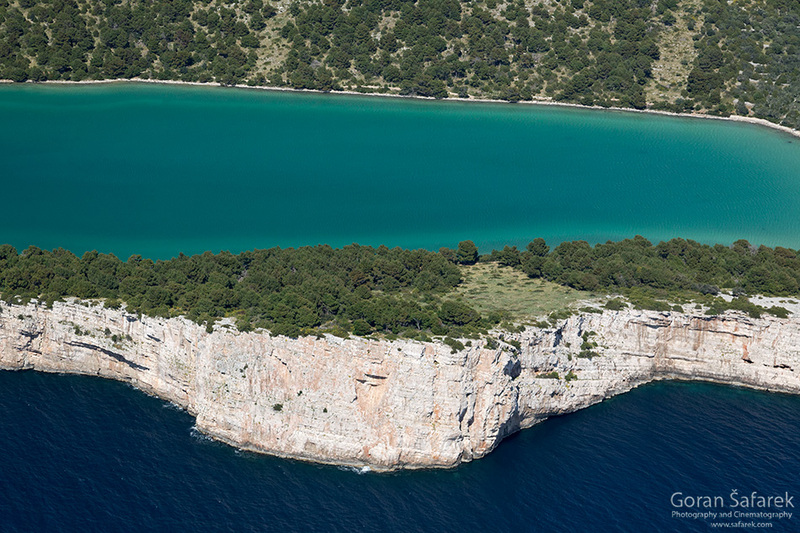 There are 25 smaller coves which greatly contribute to the indentation, and one of them – Čuška Dumboka, is so narrow and long it is reminiscent of a real fjord, as well as five smaller isles, one rock and numerous reefs. 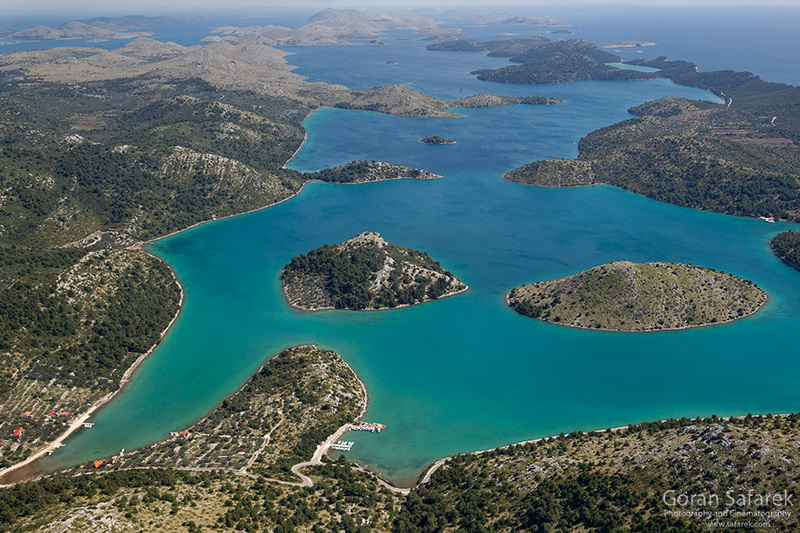 The nature park also includes several islands outside the bay, the archipelagos of Garmenjak and Sestrice, as well as Katina on the entrance to the bay. Especially interesting is the small isle of Taljurić, only three meters high and almost completely flat because of the waves that break over it and smooth it in the process. Across the small meadows at Telašćica, there is a lake called Mir, surrounded by vegetation on all sides except a small part where the cliffs face the sea. From the air the view of its turquoise blueness seems almost unreal. Due to strong evaporation and a low influx of water, the lake is even saltier than the sea, which is unique on the Adriatic. Its name is derived from the Latin word murus, which means wall, which there are a lot of in the vicinity. Due to the shallow waters of between only six and ten metres deep, the summer temperatures of the water are higher than those of the surrounding sea, and the same reason is why it is colder in the winter, so much so that it can freeze.Interestingly, the grey mud is considered to be therapeutic. Although it seems lifeless, the shallow water is abundant with large crabs and small shrimps that seemingly just float around carelessly. The muddy depths are the habitat for the common eel or kajman, as the locals call it. It seems that small eels enter through the cracks in the bottom and mature in the lake from which they cannotleave anymore. The path leads on to the beginning of the cliffs where the waves break. The surface is sometimes ripped by pods of dolphins, and the Mediterranean monk seal also once lived in the indented caves. A large portion of the nature park belongs to the sea, which is significantly well preserved. The flatter bottom features the Posidonia sea grass, it is the habitat for numerous species, and we can call it a nursery for fish and other organisms. Among them is the exotic seahorse, a type of fish which uses its tail to grab the tips of plants. Female seahorses lay eggs in a special sack on the male’s belly, and he keeps them safe until they are fully developed and hatched. Elsewhere the habitat is very different. The vertical cliffs do not end at the surface of the sea, but it remains just as vertical for dozens of meters more, forming an unbroken rock that disappears in the blueness and darkness of the depths. A reef community has developed in the shade, where the red calcareous algae and the bryozoans form the hard limestone skeleton, while the playful web of life also includes corals, especially gorgonians. The colourful and playful webs like rocky bottoms, and are often on vertical cliff faces, overhangs and undersea caves because they prefer darker spaces with little sedimentation, in other words – places where the sea is clean. The biological diversity of corals is immense, and numerous other organisms, such as polychaete, crabs and Echinodermata, live inside numerous spaces or on the surface of the corals themselves. 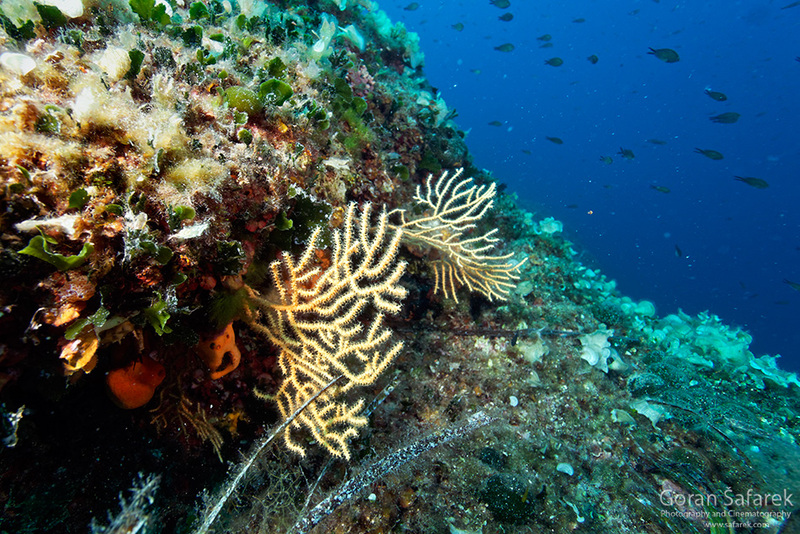 Rocky corals are found in the bay, and it is the only coral that can form coral reefs in the Adriatic. It builds clusters that grow up to 50 centimetres in height. The bay is also abundant with fish, including large open water fish such as tuna and Atlantic bonito, but most common is the saddled seabream. The undersea is abundant and well preserved in general, mostly because it is protected territory without hunting or any other kind of disturbance. Such a sea is the natural habitat for breeding of fish and other organisms, which then go to populate the restof the sea. This completes the superb natural value of the area, including the cliffs, islands, coves and, of course, the sea. With its treasures and allures, Telašćica has always attracted people as a safe anchoringspot for merchant ships in the eastern Adriatic. Apart from that, it has been a rich fishing spot since the beginning, and the oldest documents that mention fishing on our shores refer to Telašćica fishermen from the late 10th century. Since living from the sea is difficult, humans have also been using the meagre land. They have cultivated small karst fields, an oasis of fertile land amidst the rock and thickets, where olives, vines and vegetables grow saturated with sweat. Even if it is on a small scale, living off the land is still an important factor, especially for the inhabitants of the nearby village of Sali. If one leaves the asphalt road and takes one of the numerous dirt paths, they will enter a world of meticulously cultivated gardens whose greenery contrasted against the bright red earth represents a small oasis amidst the grey rock and macchia shrubs. Oftentimes there is a puddle nearby, as well as an occasional donkey resting in the shade of the trees accompanied by goats. However, it is still dominated by the olive orchards, which thrive in less hospitable karst terrain in the labyrinth of dry stone walls, on soil meticulously cleared of rocks. Less attractive, but significant in terms of surface area, are the pastures on the rocky terrain made barren by goats and sheep. All of this represents a wonderfully cultivated landscape, even today when farming and agriculture are lesser sources of income. Judging by the remains found in Krševo Polje and Dugopolje, people have been present in the area since the Palaeolithic, and the village of Sali features a site with seven items shaped out of stone dating from that period. The first settlements in the area date back to the time of the Illyrians and traces of their structures are still visible on the Koženjak and Brčastac hills, and there are also graves scattered across the fields. This is followed by a period of Roman rule, the relics of which are most visible at Mala Proversa, and consist of partially submerged remains of a villa rustica. At that stage there were vivariums for fish breeding on site, and the Mala Proversa channel between Dugi Otok and Katina was completed around that time. The period of the Middle Ages is characterised by ancient Croatian, pre-Romanesque churches, such as St. John’s in Stivanje Poljeand St. Luke’s in Čuh Polje. In the later periods Telašćica was not permanently inhabited. Nowadays, especially in the summers, the murmur of people is a common sound. They are not locals, however, but tourists. Thanks to its phenomena, Telašćica has become a significant tourist destination. In the summer months it is visited by a thousand guests a day, including numerous yachters. Best time to visit Telašćica is in late spring (June) and early autumn (September), as the temperatures are not so high and there s less crowd. 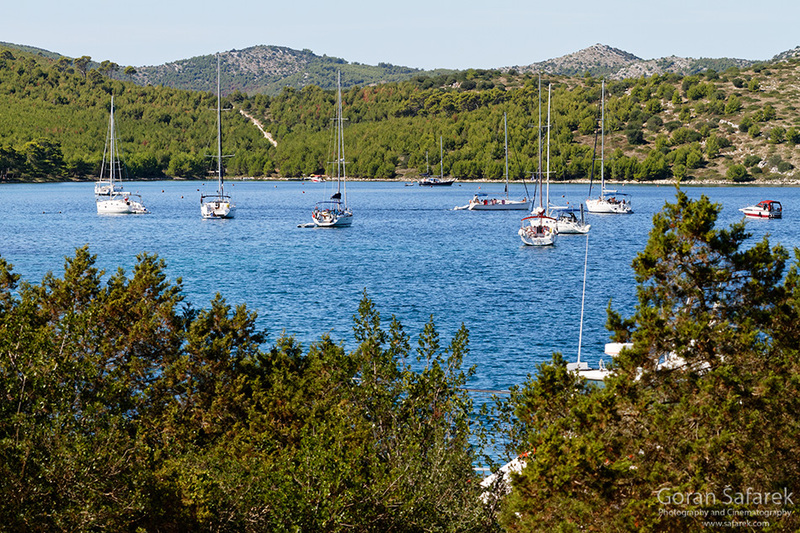 You can come by the boat as a tour from the nearby towns or directly from Dugi Otok Island. Use the bike if possible; there is not much parking space. You will not stay hungry and thirsty, with two restaurants. You can swim everywhere, so take your swimming suit.